Kahakai Kitchen: Ridiculously Good Thai Chicken & Veggie Curry Pasta and I Forgot About My Blogoversary! Ridiculously Good Thai Chicken & Veggie Curry Pasta and I Forgot About My Blogoversary! This dish has been living in my head for a while now. I love curry of all kinds but sometimes get a little bored with eating it over rice and thought it would be fun to eat it over pasta instead. Since I had most of a box of rice noodles I needed to use up, I used them for the base. You could use any curry, red, green, yellow; I chose some massaman curry paste I had in the pantry. Massaman curry is a Southern Thai curry which is Muslim in origin and is influenced by Indian curries. I would call it more savory and "spiced" than spicy, but it has a little kick to it. With some leftover chicken that I cooked in coconut milk and spices, (more about that later) and lots of colorful veggies, it made the perfect dinner and was ridiculously good, so much so that I didn't want to stop eating it. The wonderful flavors of Thailand and curry in a comforting, but not too heavy, pasta noodle dish. Made with lite coconut milk and chock full of lean protein and all those veggies, it ends up being pretty healthy too. In a large skillet or pan, stir coconut milk, curry paste, garlic and ginger over medium-high heat, stirring until paste dissolves. Mix broth and cornstarch or arrow root in a small bowl until cornstarch dissolves then mix into skillet. Stir until slightly thickened, about 2-3 minutes. Reduce heat to medium and add carrots and eggplant, simmer about 5 minutes. Add bell pepper and green onions and simmer another 3 minutes. Reduce heat to medium-low and mix in snow peas, mushrooms chicken and 1/4 cup each of the basil and cilantro and heat through. Add lime juice and fish sauce and season with salt and pepper to taste. Meanwhile cook rice noodles in boiling water according to package directions (about 8 minutes). Drain in cold water. Place noodles in serving bowl or platter. Top with sauce mixture, remaining 1/4 cup each of Thai basil and cilantro and chopped cashews. Serve with lime wedges. Notes/Results: This was perfect for me. I like my veggies to be crisp and not mushy so if you want them on the softer side, cook them a bit longer. The flavors were perfect, nicely spiced, a little heat, (you could add some Thai chili paste if you want more) and tangy from the lime. It goes together quickly and easily. Swap out the curry, protein and veggies for whatever you like or have on hand. I used the veggies from my CSA box and what I had in my fridge. I will make this again. 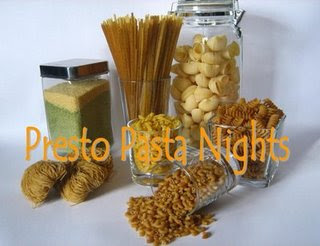 I am sending this along to Presto Pasta Nights, being hosted this week by Katie of One Little Corner of the World. If you have not checked out this fun event, there are some spectacular pasta recipes shared each week at the round-ups on Fridays. I just realized that my one year "Blogoversary" was yesterday! One year ago I started this blog as a creative outlet for my passions for cooking, experimenting in the kitchen and writing. It has been a blast and I give it and the blogging community credit for keeping me (mostly) sane over a crazy year. I have gotten to know so many wonderful people, taken part in some really fun events and improved my cooking skills tenfold. I wanted to do a little give away to say thank you and to celebrate but since I am just a couple weeks away from hitting my 300th post, I am going to hold off and do it then so stayed tuned. Love the ridiculously good thai chicken and veggie curry pasta.. did I ever tell you that you were a culinary genius? Let's hear it for many more years of wonderful food, you are my sunshine! we usually eat our japanese style curry over spaghetti noodles. this version sounds very good! happy bloggerversary, keep up your delicious adventures! tat curry look so good I can almost smell it. Hi Deb, I was wondering where you find your massaman curry around here...it looks so good, thanks! Happy blogoversary my dear! I am loving the thai flavors in this AND all of the veggies. You certainly have a knack for "inventing" delicious recipes. This does look ridiculously delicious -- WOW!! These are flavors I enjoy but don't cook with much, so I am going to have to try this one soon! And happy blogiversary, Deb! The curry looks wonderful! I love it but never make it for myself. Happy Blogoversary!!! Here's to another great year! I got the massaman curry paste at the Asian Grocery store on Beretania Street. They have a great selection of Thai foods (and Indian too) among other things. This one comes in a little can about the size of a tuna can. Happy Blogoversary! And thanks for sharing a perfect dish to celebrate it with Presto Pasta Nights. Massaman curry is my favorite kind. Happy Blogoversary!!! I've certainly enjoyed your incite & recipes!! Keep 'em coming! Happy Blogoversary! I love thai curries, they are my absolute favorite. What great flavor combinations! Thanks for sharing with PPN this week.